It&apos;s pretty hard to miss Fein Brothers&apos; distinctive home on King Drive. Published Oct. 18, 2018 at 9:02 a.m. There's pretty much no chance you've gone past Fein Brothers restaurant and bar supplies store at 2007 N. Martin Luther King Dr. and not noticed. The facade of the building is striking, and some might even say over-the-top gaudy. The mostly yellow terra cotta facade is dotted on top with a quartet of urns, and decorative elements around the windows – and up along the roof – are executed in blue and green terra cotta, creating a stunning, if loud, and unique look. With its marquee and vertical Fein Brothers sign, the place almost looks like an old Milwaukee movie palace. But the building never had a silver screen. It's history, rather, is linked to a beloved Milwaukee retailing icon. In 1883, German immigrant Ed Schuster got his start in Milwaukee, buying into Jacob Poss' business on 12th and Walnut, which was renamed Poss & Schuster. The following year, Schuster opened his own place on the northwest corner of 3rd and Brown in a building that still stands and is part of the Fein Brothers complex. Four years later, he expanded the shop to the north, but it was soon consumed by fire and in 1892, Schuster hired architects Herman P. Schnetzky and Eugene Liebert to rebuild at a cost of $12,000. Another fire started in the basement and was going strong when firefighters arrived at 4 in the morning in April 1893. In 1899, Alexander Eschweiler was tapped to expand the building. Though Schuster died in 1904, his budding empire continued to grow and continued to occupy this location at least through 1919. But by later in the 1920s, Schuster's gave up this spot in favor of its larger new home a few blocks north on 3rd Street. The buildings then became home to Harry B. Glimberg's Merit Furniture Company, whose name you can still see in the terrazzo in the entryway. Early in Merit's tenure, another fire broke out – once again not long after an alterations project was completed – and in 1929, Lindl & Schutte was hired, "to repair damage due to recent fire, (and) alter store front." That, apparently, is when the building got the face it wears today. At the same time, in 1929, Sam Fein and his brothers, started Fein Brothers in a 35,000-square foot building at 4th and Juneau. The brother moved to Florida a few months later, leaving Sam (below) as the singular owner of the plural business. In 1967, Sam moved Fein Brothers to its current home and brought his son Simie into the business. And so it went until 2009, when long-time employee Todd Minkin – whose dad also worked for many years at Fein Brothers – bought the business along with his cousin Ben Minkin from Simie (a champion handball player, pictured at right below). 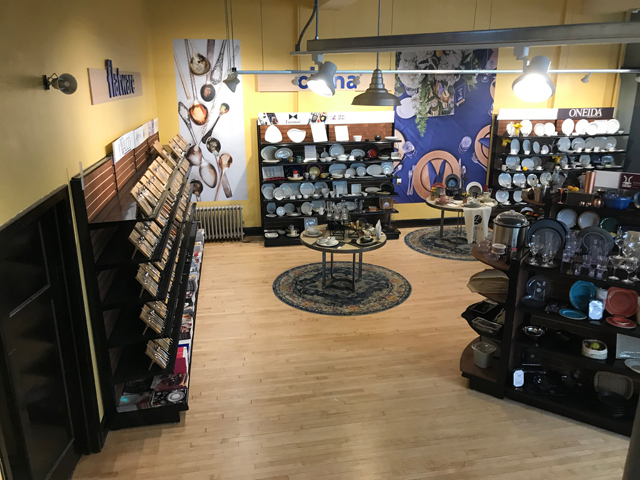 Nearly 90 years on, Fein Brothers remains the place to stock up on cooking and bar supplies, from hulking top-of-the-line appliances to used fixtures, spatulas to spoons, plates to pastry-making supplies. And the building is as cool on the inside as it is on the outside. I love the terrazzo entryway with broad display windows on either side and these elegant, time-worn brass door handles on the main doors. They hearken back to another time when retailing was more than just shopping; when it was a social experience and almost an "occasion." Inside, there are details galore that speak to how deeply department stores understood that experience of retailing and how seriously they took it. Here are a couple examples of ironwork and banisters in the old Schuster's space. The main focal point of the large store, however, is the grand staircase. As soon as you enter the shop, you can see the broad carpeted staircase welcoming you and enticing you to go up. Halfway to the second floor – some of which has been remodeled into a new furniture showroom – there's a large landing with three arched windows, reminding us we're in a temple of commerce. ... is now home to a small museum that wraps around a conference table. 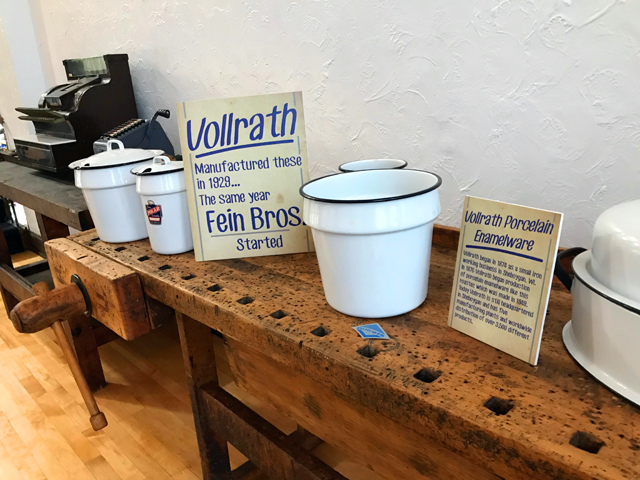 Here, you can find vintage kitchen equipment, cookware, a cash register and other items that Fein Brothers has carried over the years. When you go back outside, head around to the back to see the mezzanine windows, which look pretty impressive even from the alley. In this main building, toward the front, there are three arched openings that mimic those windows and are supported by twisted Solomonic columns (first photo below). In the older space to the south, there are decorative tin ceilings and plaster elements (second photo). In the back corner of the main floor, the floors have been refinished and a flatware and china display area has been created. There are also a number of interesting aspects to the building(s) that most people don't get to see. One of them is a vault that used to be piled full of cash back in the days before credit cards, but now is mostly a fun curiosity with stacks of paperwork dating back to at least the early 1970s. Interestingly, the vault (which used to be hidden by shelving is now revealed for all to see) is not located where an old Sanborn map shows a vault having been located at the turn of the previous century. While I'm not sure if anyone ever lived up above the original Schuster's store on the corner – the one with the great turret – it sure has the look and feel of an apartment on the second floor. And the turret's five tall windows would've offered a resident a pretty panoramic view down 3rd Street, which was one of the city's main shopping thoroughfares for many years. The best view of all, of course, is to be found on the roof, where you can get a nice look at the Downtown skyline. Ben Minkin (pictured in the vault photo above) says that the rooftop also offers a fine look at Lakefront fireworks. To get there you have to pass through the building's rarely visited third floor, which is used mostly for storage. On the second floor, in an office at the front of the building, there is a trove of really cool miniature models of a wide variety of restaurant equipment and fixtures, from sinks to banquettes, ovens to booths. That's because, years ago, in addition to selling restaurant and bar supplies, Fein Brothers also designed many of the spaces they were outfitting. These models were used to design the spaces and ensure they'd be to the customer's satisfaction. Many of the models are on view in the mezzanine-level museum. Down in the basement, in the north wall, I found this hole in the foundation and it appears to snake in quite far, making me wonder how it got there and where it ultimately leads. Minkin wasn't sure, either, but it makes a great conversation piece.